Never a Dull Moment Knife Shop in Branson Landing is a perfect place for those who are looking for quality knives. This knife shop has been involved in the knife business for more than twenty years. Their knowledge and expertise of the product they sell, including consultation and teaching techniques, sets them apart from their competitors. Shopping in Branson is never a dull moment for knife enthusiasts once they see a wide selection of quality knives. Never a Dull Moment Knife Shop is Branson’s exclusive dealer of Oakley Standard Issue Eyewear. This shop sells many exclusive in store only items and offers unmatched customer service in a pleasant environment, where the quality being foremost in product and service. When you visit this knife shop, you’re right away entertained and you’ll be assisted to select the right item that suits your needs, whether for work or play. 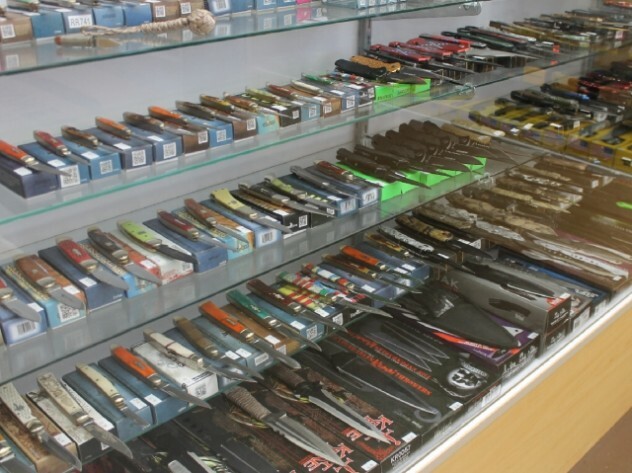 They want you to be fully satisfied with your unique shopping in Branson at Never a Dull Moment Knife Shop – a great place to find the sharpest knife you’re looking for. This specialty knife store offers a wide selection of knife brands, models and types, including collectibles and limited editions. The shop also carries sporting and outfitter supplies, in addition to a variety of camping tools and accessories. The products sold here are not just run-of-the-mill items, this is a full-service store and showroom providing customers expertise, consultation and teaching techniques to help them choose the right product that suits their needs. It’s their product knowledge and experience that sets them apart from their competitors. This specialty shop considers their customers extra special. Never a Dull Moment Knife is Benchmade authorized dealer of which the large knife selection includes Benchmade Blue Class, Benchmade Black Class, Benchmade Golf Class, Benchmade Hunt Class, Benchmade Assisted Open, Al Mar Knives, Case Knives, Cold Steel Knives, Columbia River Knife & Tool, Emerson Knives, J.A. Lonewolf Artisian Knives, Kershaw Knives, Microtech Knives, Original Dog Tag Knife, Spartan Blade U.S.A., Spyderco Knives, and Tops Knives. Other merchandise that you can find in this knife shop includes Branson Beef Jerky, Fenix Flashlights, John Rasmussen, and Leatherman. While this knife shop is located in Branson Landing which is considered by many visitors as the shoppers’ paradise in the Midwest, you will always be tempted to shop for more. At Branson Landing, you can shop many great shopping items at Belk Dept. Store where you can find great features of popular brands from Liz Claiborne to Nike. For visitors who are sport enthusiasts, don’t miss to visit Bass Pro Shops in this great shopping destination where you can find everything you need for your next outdoor adventure. The landing also features a variety of niche shops like Cardinals Clubhouse with wide selection of St. Louis Cardinals gear and ladies apparel. So, if you are shopping in Branson and looking for quality knives or want to buy something as a gift, Never a Dull Moment Knife Shop is the place to visit.